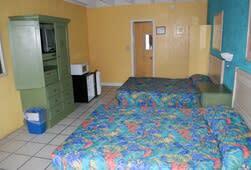 Welcome to the Plaza Motel, located in the heart of the Miracle Strip on Panama City Beach, Florida. This motel offers great rates for guest who are looking to stay for a day or a week. We are across the street from the beach with two public access and less than a min walk to the beach and the water park,peir,restaurants and bars. We are a family owned and operated motel with a pool and a store that people love to hangout grilling, swimming and just relaxing at the pool . Our store stays open 24 hours a day most of the year with great subs,beer,wine. soft drinks, beach supplies and tanning bed.